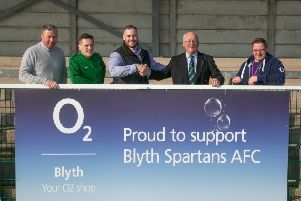 Tony Breeden’s 73rd-minute penalty save from Sean Reid denied Blyth Spartans a share of the spoils on their first-ever visit to the Phillips 66 Community Stadium. Reid’s miss followed 22 minutes after Daniel Udoh fired what proved to be the winner following delightful footwork from Matt Dodd in the build up. The narrow defeat meant Spartans’ three-game winning streak was ended, but they can still remain positive having finished the afternoon with a seven-point advantage in the race for the play-offs. It was an exciting opening 20 minutes, with the hosts almost getting their noses in front after just five minutes. The ever-threatening Kieran Dunbar nearly caught Peter Jameson off-guard with a driven 30-yard free-kick. Jameson dived to his right to push the effort away. Spartans then grew into the game but Dunbar was a danger and shot narrowly past. Rivers went close for the visitors with his attempt rising over the crossbar. A few minutes later, Leamington had the Blyth defence stretched but Dodd’s poor first touch allowed Ryan Hutchinson to get across and block the winger’s shot. And Dodd’s wasted opportunity almost propelled Spartans into a half-time lead – on two occasions through Rivers and Langstaff, who struck a post. The second half also began at a pace and Robbie Dale fed in the unmarked Reid but the midfielder disappointingly struck straight at Breeden. The deadlock was broken when Dodd sniffed out the unmarked Udoh, who side-footed the ball home. To Blyth’s credit, they instantly pushed for an equaliser and Dale went close with a free kick. In the 72nd minute, Spartans’ quest to earn at least a point looked on as Ryan Hutchinson fell to ground in the penalty area, leaving the referee to point to the spot. And without destinated penalty-taker Hopson, Reid took on the responsibility but was left unsuccessful as Breeden dived the right way to keep it out. Dale tried to his best to drag Spartans back into it in the final 10 minutes – with the best of his two late chances requiring a superb strong hand from Breeden to tip in behind.